I always look forward to Me Made May every year, and this one was no exception. Documenting always gets to be a pain in the neck by the end of the month but it’s so worthwhile. Having a full month’s record of how I mixed my looks really helps me to focus my sewing and come up with new variations. This year I really had a wonderful selection of makes, though quite a few have been retired, or put in my refashion bin. I hate to waste makes! My style has changed again this year. I just started working from home as a photo retoucher so I’m a bit more casual, but still trying to keep up the more stylish vibe I was wearing to work last year. It’s taken a few years of sewing for myself to realize what silhouettes and patterns work for me and make my style a bit more cohesive. I’m amazed that over 31 days I had no full repeats. My big takeaway though is that I need a few more lightweight bottoms. It’s now June and way too hot for jeans. 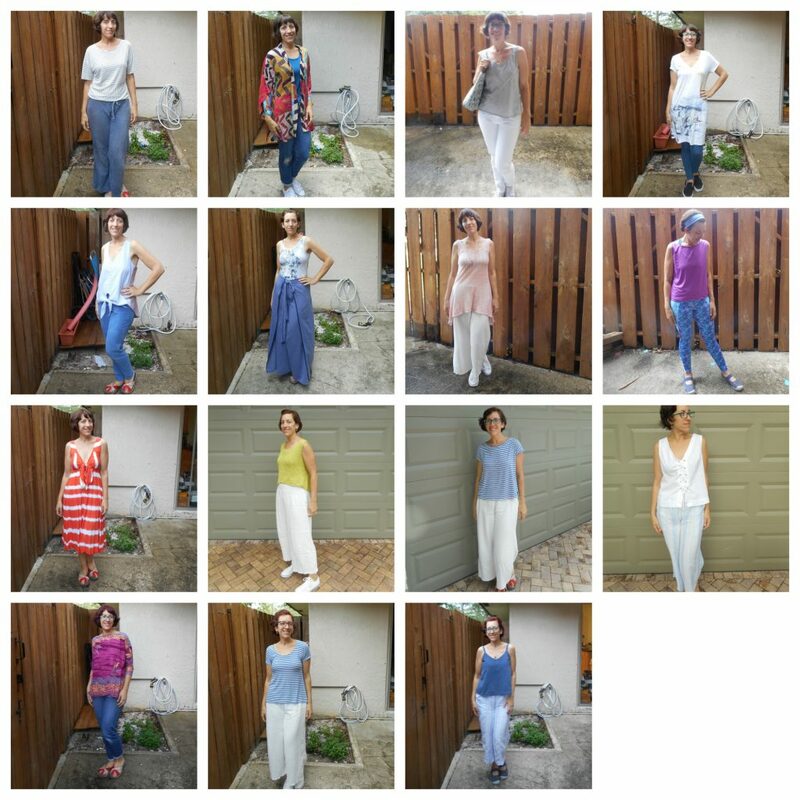 My most worn items were my cream culottes (worn 7 times)- I just love them. Comfy light and airy! And having a simple tee -like my two striped Sophie Tops, my Odgen Cami’s, and my knitted tanks make getting dressed easy and comfortable. So over this summer I’m going to try to fill in those gaps. 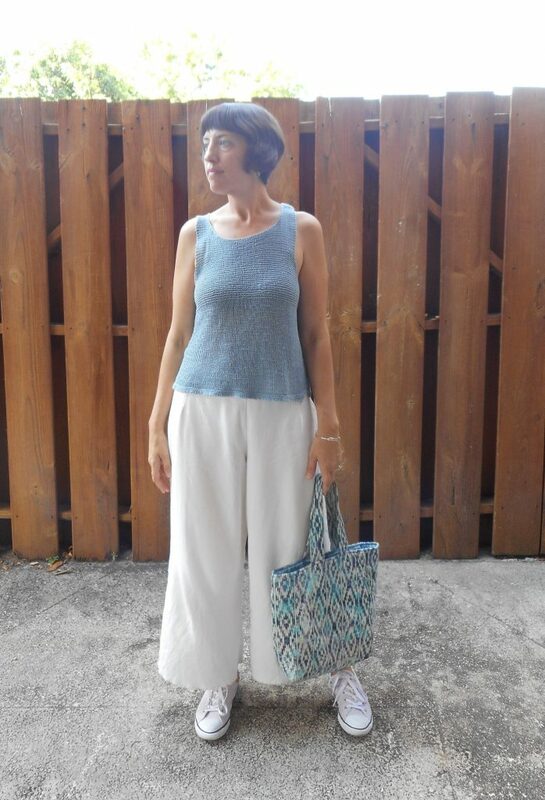 I have a few more bottoms planned- shorts, long skirts, and another pair of culottes. Plus a few more knitwear pieces, mainly polished tees that can be tucked in. I’ll be sharing my summer sewing plans soon. I’d like to also make some dresses that are a bit more casual for daily wear. I have plenty of dressy pieces but I just don’t get much wear out of them. I made just a few pieces this May (shown above-to be blogged about soon!). My busy schedule has left very limited time to blog and sew. 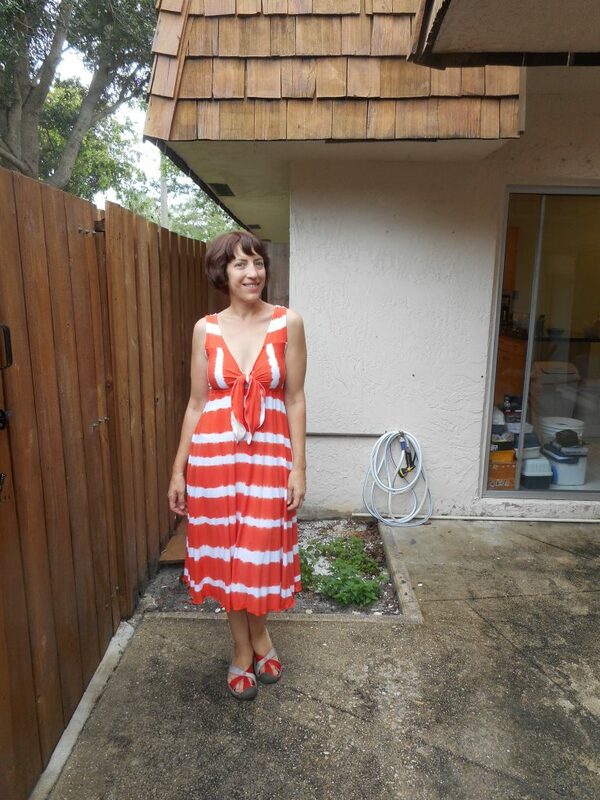 I made the orange and white refashioned Vogue dress, V9312. Definitely one of my favorite refashions! I need more bold fun prints in my life. 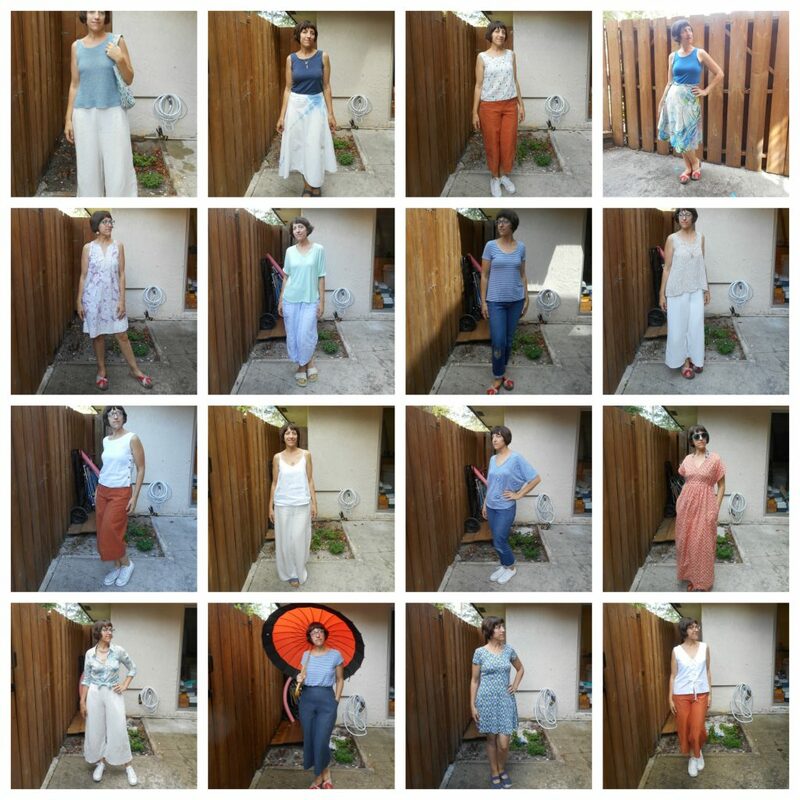 Lately I’ve been making my first version of a pattern as a wearable muslin by refashioning or buying remnant fabric. 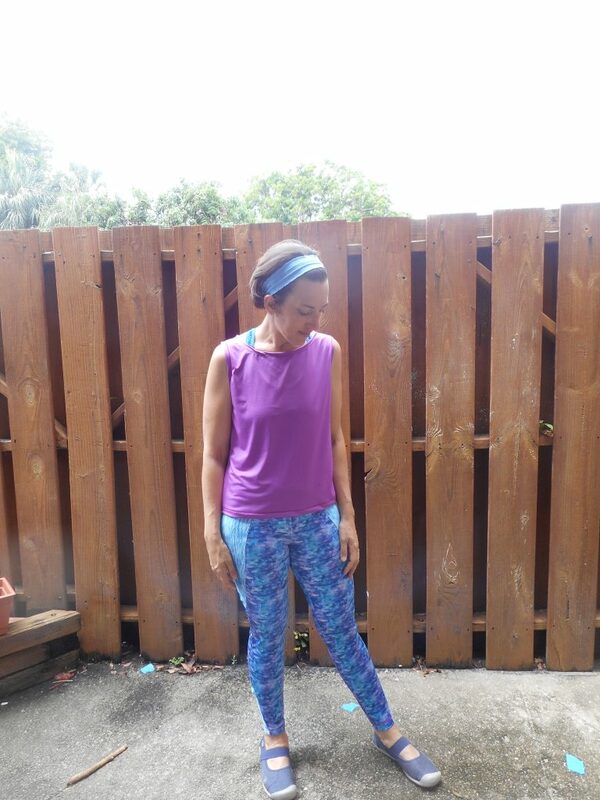 I also made a workout outfit using McCall’s M7663 to try out the pattern in inexpensive material. Plus I finally finished my spring green Shibui Slope Tank in Twig-I’ve been knitting that piece for the last two months while the kids are playing at the park. 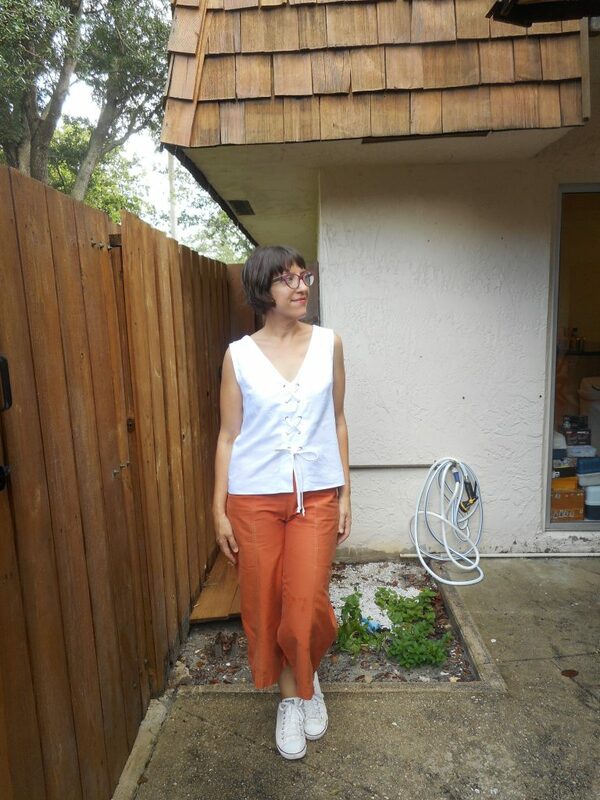 I also whipped up a grommet tie white tank blouse based off at top I saw at Anthropologie. This was also our first full month in or new home! All the basics are now setup, everything has been painted and fixed, though we still have a lot to do to get this fixer upper to where we want it. I’ve been exercising regularly since the move and feel fantastic. It really helped my energy level and I just love feeling strong. We also celebrated Mother’s day and our 12th Wedding Anniversary and today is the kids last day of school! It’s been a busy but wonderful month! Back soon with some newer makes! If you’d like to see what I wore in more detail from Me Made May be sure to check out my Instagram feed @sewpomona. Happy Summer Sewing! Thanks so much! It is! My color choices have really focused over the last few years. I save the bolder and more vibrant prints for dressier wear (which I don’t wear as often).